Wyrm (Japanese: 幻（げん）竜（りゅう） Genryū, "Phantom Dragon") is a Type of monster introduced in Duelist Alliance. A wyrm (pronounced worm or vurm) is a type of dragon that commonly appears in British and Norse mythology. These dragons have no legs or arms and only the long, scaled body of a serpent. They are often given poisonous breath and the ability to regenerate or reattach pieces of their body that have been cut off. Wyrm-Type monsters resemble dragons, but unlike Dragon-Type monsters, they take more of a spiritual, mythical, metaphysical look. Most of the initial Wyrm-Type monsters were part of the "Yang Zing" archetype, which seems to be based on Chinese dragons and/or other animals within Chinese lore, such as tigers, resembling "Tiger Dragon" and "Orient Dragon" (which are both Dragons, however). 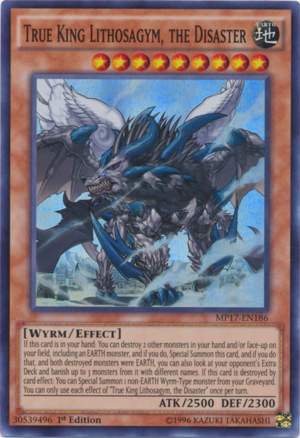 "Dracocension", the first generic support card for this type, hints that there is a relationship between Dragon-Type monsters and Wyrm-Type monsters. After the release of the Yang Zing, two more archetypes have been released: "True King"/"True Draco" and "Metaphys". This monster Type is similar to the Psychic Type, which usually resemble another Type of monster (such as the Machine-Type "Jinzo" monsters). In addition, they debuted in the first Booster Pack of a TV series (5D's and ARC-V), in which a new Summoning method (Synchro and Pendulum) was also introduced. Later, the Cyberse Type followed this similarity, being introduced in the first Booster Pack of Yu-Gi-Oh! VRAINS that introduced Link Summoning. There are currently no Wyrm-Type Ritual Monsters. This page was last edited on 3 June 2018, at 02:37.